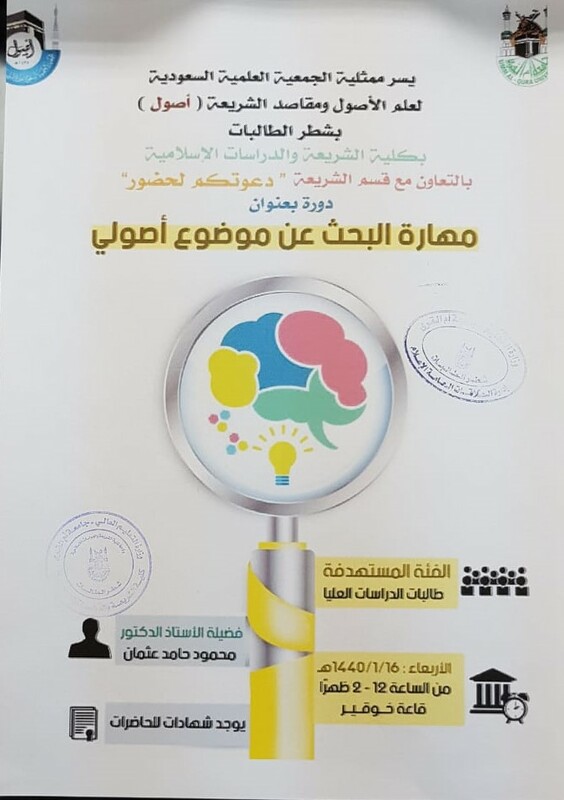 The Saudi Scientific Society for the Sciences of Usul and Objectives of Sharia, affiliated to the College of Sharia and Islamic Studies, in cooperation with the Department of Sharia at the girls section held a course for graduate studies students entitled "The skill of searching for an Usul subject" presented by Dr. Mahmoud Othman on Wednesday 16 Muharram1440AH at Khouqier hall. The course aims to help students choose their subject of the research and give them the skills to carry out scientific research, which saves time and effort in choosing the appropriate subject according to their exact specialization. He spoke about the skills of selecting the Usul subject, including arranging the contents of Usul in a logical order, based on the order of scientists, in addition to looking into the recommendations of scientific theses and encyclopedias of fiqh and Usul as well as scientific journals, and communicating with specialists in the field, in addition to attending scientific discussions. 1- Structural or applied theory study. A number of female graduate studies students have attended the course, as well as a group of students of the bachelor's degree stage given the importance of the topic, and all their questions were answered. At the end of the course, the representative of the society, Dr. Hwaida Al-Lahibi, thanked the Sheikh who delivered the course for his efforts.